Let me be the first one to tell you that you did a great job with this one!!! All 4 of them are cool! 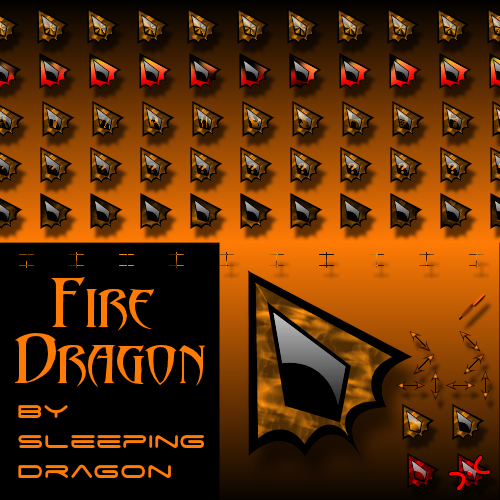 Sleeping Dragon, I'm finding myself looking forward to each set you make. These are all so sleek and well made. Thanks for putting together such polished collections for us to enjoy!!! I'm going to tell you what, that has been the best cursor I have seen you made so far. keep up that good work and keep improving what you do I really like your progress... . Okay, I'm back to using your cursors. This is pretty cool. Like those animations. You're getting darn good at these Dude. Sleeping Dragon, These are really cool! You've done a great job with the animations and I like the shape. Keep up the good work my friend! Great work! The animations are really cool. Another fine job Bill. A very rare color. And what an incredible element it is! Thank you, J. Aroche, boldyloxx, aimzzz, DZ the man, BigAl Tho69, BichurBuddyTroll, RadialFX (cursor guru), my friend Yrgal, Ambassador NT, Cynder and Jeff T. I appreciate your comments very much, and am glad that you like it. Again, it was fun to do. Perfect, goes completely with my theme. Awesome freakin job!! Man you outdid yourself this time. This is perfect for my use and the color scheme is out of this world. I had a hunch that since it was taking longer than usual for you to release a new cursor, that this one was going to be your best yet. It Is! 5 stars to the tenth power. Worth the wait. Now wheres that all seeing eye ? Thank you theroot. The time delay was due to "life" rather than skinning. Either way, I'm glad you like it. Very good and cool. Sorry, I mean hot.